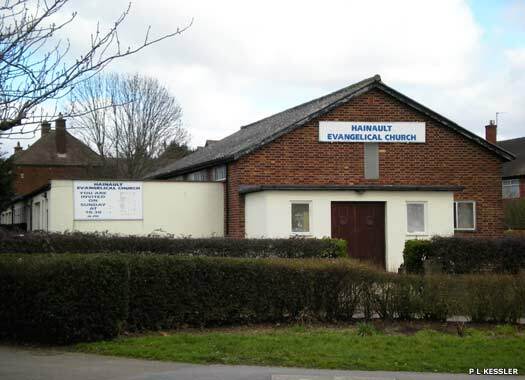 Hainault Evangelical Church is on the south-eastern corner of Regarder Road and Manford Way, on the easternmost section of the Hainault Estate. This estate replaced large areas of Hainault beyond Chestnut Grove and between Forest Road and Elmbridge Road which had been covered with hundreds of 'prefabs' built on them immediately after the war. The church itself opened as Manford Way Gospel Hall before being renamed some years later. The Parish Church of St Paul sits back from the pavement on the northern side of Arrowsmith Road. In January 1951 the congregation first met in the Crush Hall of Manford Way Secondary School. This was the beginning of St Paul's Mission Church, to be a daughter of All Saints, Chigwell Row. 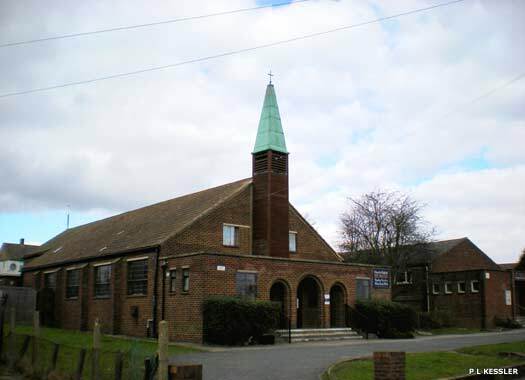 Sunday schools and Saturday evening services were held in the school hall, and mid-week services and meetings were held in private homes on the Hainault Estate. A site for the church was selected in Arrowsmith Road, and its foundation stone was laid on Saturday 31 March 1951, in the pouring rain. The building was to be a dual purpose church/hall, the first of its kind in the diocese. The work was completed and the building dedicated as the St Paul Mission Church on 17 November 1951. 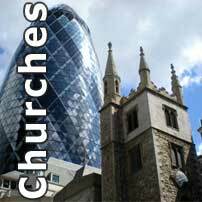 By 1955, the church had gained its own parish, and it was consecrated on 6 April 1963, by which time it had gained a 'tower'. 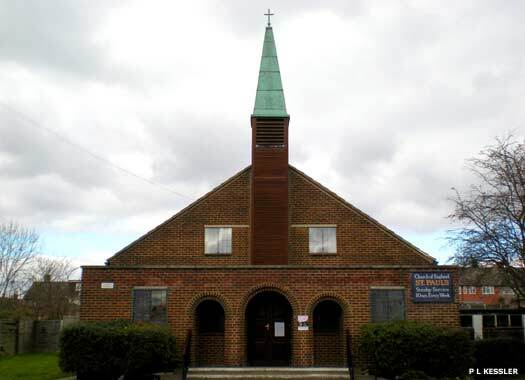 Grange Hill Methodist Church is on the northern side of Burrow Road, on the eastern corner with Holt Way. The church was one of several to be founded on the London County Council's Hainault Estate, in 1952. The area grew rapidly as the new generation of post-war houses were put up and the bombed-out population of the East End of London moved out from their prefabricated housing south of Hainault, where they had been living since the end of the war. 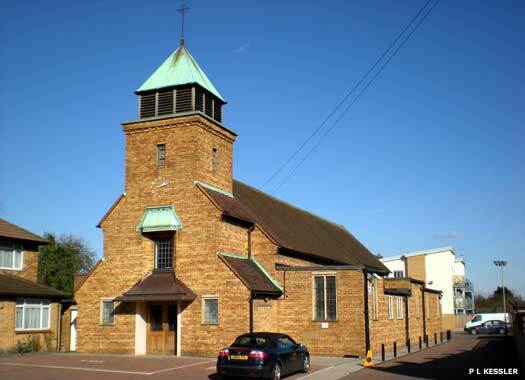 The Parish Church of St Francis of Assisi lies on the eastern side of Fencepiece Road at the northern end of Fairlop. An iron church, called the Maypole Mission, was opened here in 1890. In 1935 the foundation stone of a temporary church was laid and in 1938 a conventional district was formed. The present church was opened in 1956 based on a design in a traditional style by J J Crowe, and has an unusual tower with broad offsets, which create a spreading structure. 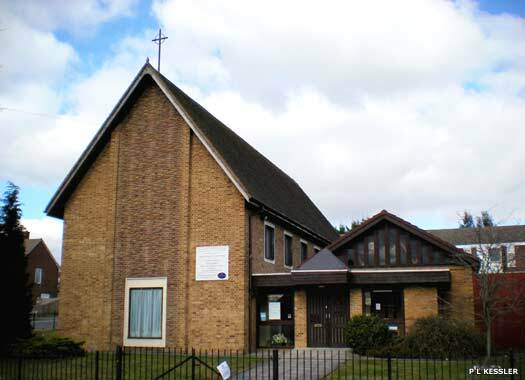 Fairlop Evangelical Church is also on the eastern side of Fencepiece Road, immediately south of St Francis of Assisi and north of the playing fields which lead to the centre of Fairlop at New Fairlop Oak. 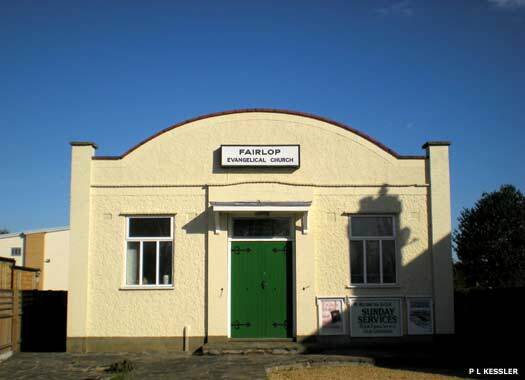 The hall opened as Fairlop Gospel Hall in 1934, built very much in the art-deco style of that decade, even though it is a relatively minor and inexpensive construction. Its opening was followed a year later by that of St Francis' temporary church next door.